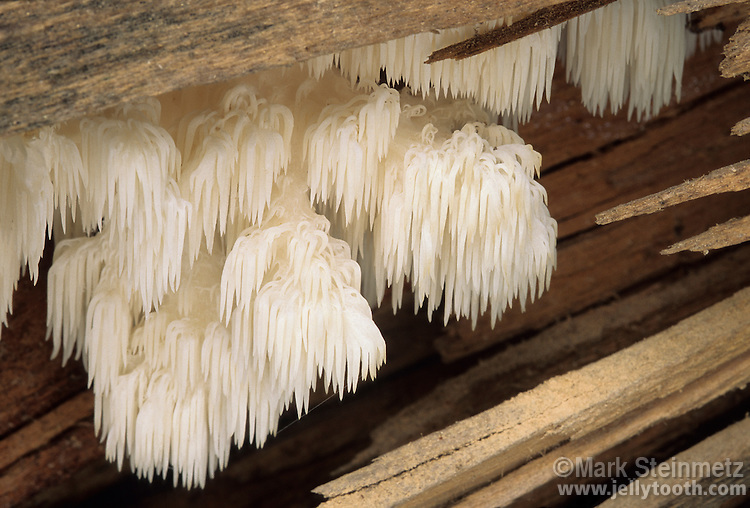 Bear's Head Tooth (Hericium americanum), also known as Lion's Mane, Icycle Mushroom, Bearded Tooth Fungus, Old Man's Beard, and Pom Pom Mushroom. Regardless of preferred common name, this mushroom is considered a choice wild edible by most. Cultivated forms are sometimes found in grocery stores. Saprobic and parasitic, fruiting from wounds of old hardwood trees, or recent deadfalls. This tree was an old growth oak, recently downed by storm in the Big Woods Nature Preserve, Hueston Woods State Park, Ohio, USA.